What is going on in that Sussex county Registry of Wills office and why? What’s with that fire in legislative hall? Why can’t we have Punkin Chunkin in Delaware? We may not have all the answers but we got lots of questions. Join us for the intrigue of it all. Just one big freaking OMG that this thing has been cancelled less than a month before the event. I remind yon ladies and gems that Punkin Chunkin was removed from Sussex county because, specifically, liability insurance is too high to make the event profitable and even efforts to legislate a reasonable cap on liability awards did not work. The 2015 Punkin Chunkin event scheduled for Dover Downs in November has been canceled. The Punkin Chunkin Committee today (Thursday) announced the cancellation; the event had been scheduled for November 6-8. The Board says unfortunately, despite the best efforts of the Board throughout an exhaustive, nation-wide search, members have been unable to locate a willing insurer to adequately protect our host venue, our organization, our fans and our spectators. The Board says it cannot be more thankful for the efforts of the volunteers, the best efforts of the agents and the patience of the teams, fans, prospective hosts at Dover International Speedway, vendors and sponsors through this difficult time. Customers who purchased tickets to attend the event will see a 100-percent refund on their credit cards within 7-14 business days. Any questions can be directed to 800-441-7223. State Senator Brian Pettyjohn, doing what he was elected to do, worked diligently to get this event returned to Sussex county, including trying to pass a state law with limits on liability. In 2013, some turd got hurt in an ATV accident and I hope God does not bless the jerk because it’s ruined for all. I heard Brian Pettyjohn on the Duke Brooks show just now and God Bless he is still fighting the good fight. This event raised over 20 million bucks for charity. It is a way to bring the folks down to the west of the state and they can then enjoy the race tracks and the beaches. Also some tax free shopping. But the Democrats turn it all down for who? For the TRIAL LAWYERS! Do not let them tell you not. Contact Patty Blevins and tell her to let Brian’s bill to limit non-economic lawsuits to a million bucks. NON-ECONOMIC folks. A pumpkin hits you in the head and you can’t work….there’s no limit….that’s an ECONOMIC reward. It’s for political expediency pure and simple and Brian Pettyjohn, much as I love you, I think you might be in over your head. State Senator Bethany Hall-Long has formed a campaign committee for the office of lieutenant governor, which allows her to begin fundraising and signals her possible addition to a crowded field of candidates. Hall-Long has represented the Middletown area for more then a decade as both a state senator and representative. Should Hall-Long officially enter the race, she would join four others seeking the office. Announced candidates include Kent County Alderman Brad Eaby, New Castle County’s Register of Wills, Ciro Poppiti, Rehoboth Councilwoman Kathy McGuiness, and former Sussex County Register of Wills Greg Fuller. The office has been vacant since Matt Denn left it after becoming Attorney General in January. First thing Bethany, get your husband out to steal the opponent signs! 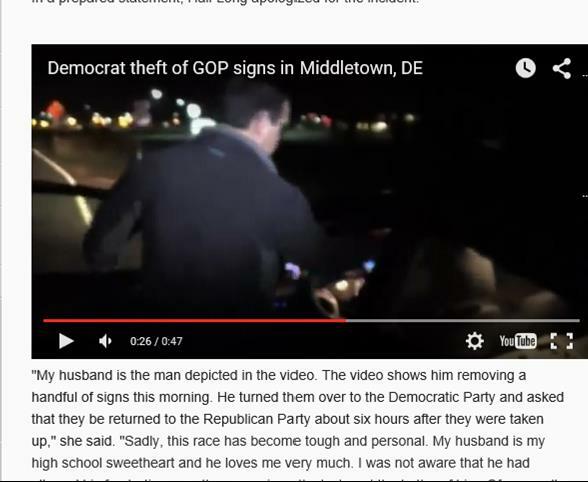 Indeed it was Bethany’s husband who was caught stealing opposition political signs, EVEN WHEN ON PRIVATE PROPERTY, and of course we should vote for such a fine ethical wife who encourages such behavior. THIS is why you should bring Punkin’ Chunkin’ back to Delaware. For Delaware, once called the small wonder, is the LEAST visited state in the union. Below is why folks should come here, adding, of course, the great fall Punkin Chunkin festival. Why you should visit: Two words: tax-free shopping. It’s like a statewide 8.5%-off sale EVERY SINGLE DAY!!! Beyond that, there are the beaches, routinely ranked the cleanest in the country, from the party-heavy Dewey Beach, to famous Rehoboth Beach, to the scenic Delaware Seashore State Park. For those who live in modern suburbs, you can get a taste of historical America on the cobblestone streets of Old New Castle, miles of Revolutionary War battlefields, and the old confederate POW prison at Ft Delaware. And, of course, the Gilded Age DuPont mansions. And for sports fans, you can watch a NASCAR race at Dover or experience a tailgate that’s more like a family picnic before a University of Delaware football game. The tailgates outside UD’s stadium are less of a huge frat party than a massive get-together where everybody knows your name. What a mess THIS is making yon ladies and gems! Delaware’s former chief medical examiner has been sentenced to 11 months probation and 500 hours community service for misusing state resources in running a private consulting business. Richard Callery, fired last year amid an evidence-tampering scandal in Delaware’s drug testing lab, was sentenced Friday. He pleaded no contest in June to two misdemeanor counts of official misconduct, each carrying a maximum penalty of one year in prison. Callery also reimbursed the state $100,000 and agreed to a suspension of his medical license. The evidence-tampering scandal resulted in the arrests of two state employees and prompted dismissals or plea bargains in scores of drug cases. It also led lawmakers to abolish Callery’s office and replace it with a new forensic science division under the Department of Safety and Homeland Security. Now I am to understand that all of the cases handled by this office are subject to re-trial, possibly. Somebody tell the trial lawyers with all the power, we’ll give them all the cases from this medical examine if they will give us Punkin Chunkin. What’s Going on in that Register of Wills Office? Folks I been following Judson Bennett’s look into the issues with the Register of Wills office and I think I understand it. Judson’s email missives have been many and very insightful. 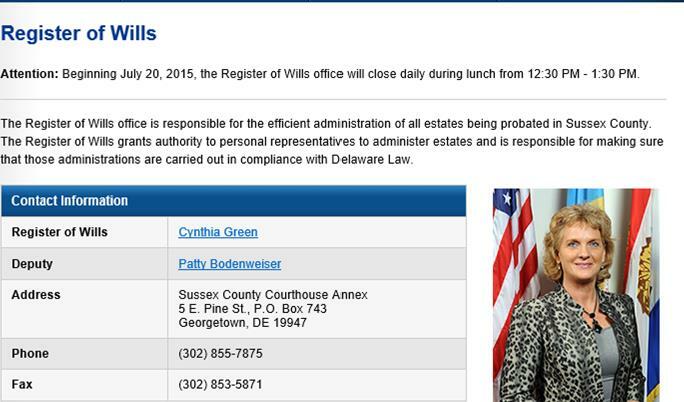 It would seem that one Chancellor Bouchard of Delaware’s Chancery court is busy appointed inadequate, pathetic people to be elected Sussex county Register of Wills, Cindy Green’s chief deputy. Now we all had or have jobs, right? What kind of logic would have the head of an office unable to appoint his or her chief right hand man? But this is Delaware and it is, of course, corrupt. Below a copy of Chancellor Bouchard’s response to Judson’s letter. We write concerning the email you sent to the Chancellor on Monday, October 5, 2015. Your email reflects a basic misunderstanding concerning the situation in the Sussex County Register of Wills office to which the Court feels a response is necessary to set the record straight. There is absolutely no misunderstanding on my part. In fact it is obvious that many of the facts have been ignored or misrepresented in this letter. Indeed, the record was not set straight. Be advised that I have interviewed Cindy Green, the elected Register of Wills for Sussex County, at great length and the so called facts herein represented do not jive with Register Green’s position and those within the office of the Register of Wills. Cindy Green, who has been twice elected by a huge majority of the people in Sussex County, is an honest, forthright, Christian woman who has the best interest of her office and that of the people at heart. Her position and perception of the facts are what they are and I am certain her credibility is without any doubt. As an initial matter, it is important to understand that the Register of Wills serves as a vital arm of the Court of Chancery. I always did understand that. I am very well educated and quite familiar with the internal workings of the County government . This historical role derives from the Court’s oversight over the administration of decedents’ estates as part of its equitable jurisdiction. In that vein, the Court hears, among other matters, exceptions to estate accountings, petitions to determine the order of priority for distributions of estate property, petitions to authorize the sale of real estate owned by a decedent, and rules to show cause concerning the removal of estate representatives. With respect to each of these and many other matters, the Register of Wills serves functionally as a branch of the Court. The Court-appointed chief deputy, in particular, serves as a liaison to the Court when these matters are presented for judicial review. The statute governing the Register of Wills reflects this role. The first provision of that statute states that “[i]n performing the functions of the office, the Register of Wills of each county shall act only as a Clerk of the Court of Chancery.” 12 Del. C. § 2501. Consistent with this purpose, the statute further provides that “[t]he Chancellor shall name a chief deputy register of wills for each county who shall perform such duties as shall from time to time be assigned by the Court of Chancery.” 12 Del. C. § 2507(a). There is no disagreement here on the law or the function of the office of the Register of Wills and this was never the issue. In accordance with its statutory obligation to name the chief deputy in each county office, the Court has taken very seriously its responsibility to identify and select the best qualified person to serve in that position in the Sussex office. When a vacancy arose in December 2014, the opening was advertised publicly to solicit candidates. Candidates were required to complete an application and were vetted by a committee consisting of the two judicial officers of the Court of Chancery resident in Sussex County (Vice Chancellor Glasscock and Master Ayvazian), the Register in Chancery, the Director of Human Resources for Sussex County, and the elected Register of Wills. This committee went through an erroneous process, ignoring the most qualified and hiring the least qualified. The candidates were ranked based on a set of criteria for the job, the Chancellor interviewed the top three candidates, and chose the one who received the highest ranking from the interview panel. It is absurd for anyone of reasonable intelligence to accept this answer as valid, knowing who was picked for the job and how she turned out. The candidate selected was arrested for driving on a suspended driver’s license. She was consistently late for work, sometimes as much as 2 hours. She was disruptive and totally incompetent and ultimately was fired by the County Administrator, not the Register of Wills. There was no obligation to go through such an extensive process to select a candidate, but the purpose of doing so was to ensure that the selection process was objective, focused on job performance needs, and allowed all interested parties to have a voice in the selection process. There was no way that the process was objective and was obviously political in nature. Interestingly, there was no vetting process for the 2nd hiring which did not work out or for the 3rd?? Why not? This was misrepresented in your letter. but it must be said that your criticisms of the current Court-appointed chief deputy are unfair and unfounded. Richard Kiger, Esq. served for fourteen years as a Master in Chancery and was the chief deputy in the New Castle County Register of Wills office for eight years. He is considered an expert in the field of decedents’ estates, having served on the editorial board for the policy and procedures manual recently issued by the New Castle County Register of Wills, and he is held in high esteem among estate practitioners throughout the State. He has been tasked with conducting a complete review of the Sussex office in order to address deficiencies in its current operations. (While all this may be true, it does not rectify the fact that he is incapable of doing the job now before him. He retired eight years ago. He is not up to date with any of the electronic leaps and bounds that have been made since his retirement. Unfortunately, one of Mrs. Green’s staff is currently in the process of step-by-step training him as to how to open an estate which is taking time away from her regular duties. Can’t you see how ironic this is? Why should Mrs. Green be required to run a chief deputy school? Why can’t you appoint someone that does not have to be trained?) Interestingly, Mr. Kiger is receiving a salary based on a rate of $67,800 per year, plus he is being reimbursed for his housing? This job pays traditionally $45,000 per year and in no way is the Chief Deputy supposed to be receiving a housing reimbursement? The tax payers of Sussex County are paying for this and it is not justified. As an example, the office currently uses manual procedures (absolutely untrue!) to track estate information, which should be done electronically. (Apparently, you are unaware of the fact that this was rectified before he was ever appointed.) It is done electronically and was and is being done by current office staff. The Court of Chancery has recognized the importance of using modern technology and has been a leader in implementing technological improvements, such as the adoption of electronic filing for its civil action docket over ten years ago. During the past several years, the Court has worked with the Register of Wills offices statewide to transition their estate filings to e-filing. Among the benefits of e-filing are the reduction of staff time required for the processing and retention of documents, and the increased accessibility of information. With the Court’s support, e-filing was implemented successfully in New Castle County in 2012 and in Kent County in 2013. To assist with its implementation in Sussex County, in 2014, the Court provided financial resources to the Register of Wills office to help address its archiving backlog. Unfortunately, despite many requests, the Sussex office was unwilling to implement e-filing on its own initiative, necessitating that the Court set a deadline for it to do so. Now that e-filing has been implemented in the Sussex office, effective July 1, 2015, we are confident the office will realize the efficiencies of transitioning to this system that the other offices have experienced. The system was organized and implemented by current staff and that person is an expert on electronic filing. The system of having county offices serve as arms of the Court with elected officials can present challenges. Over a decade ago, when the Register in Chancery was operated in the three counties with separately elected officials, the Court experienced some tension in that relationship before those offices were consolidated into a statewide system. But the relationship between the Court and the Sussex County Register of Wills should not be political or partisan. Indeed it should not be, however considering what has transpired so far, there is the appearance of an impropriety ! (It appears that you made it political and partisan when you selected an inept democrat to replace an inept republican. Mrs. Green is now recommending a democrat to be selected and you are still ignoring her recommendation. This person is highly qualified. If you were to select her, this issue would go away immediately and the office would proceed properly, yet you continue to stonewall Mrs. Green. You have put three people in the job. None of them have worked out so far. I urge you to follow Mrs. Green’ advice and select her candidate as a permanent Chief Deputy. As you note in your email, the current chief deputy is serving an interim appointment. It is the Court’s hope that at the conclusion of his tenure, improvements to the operations of the Sussex office will have been implemented to better serve the citizens of Sussex County and the State, and that a suitable replacement will assume the duties of chief deputy on a permanent basis at that time to continue that progress. It is the hope of the citizens of Sussex County that the court will appoint someone who is able to do the job. It is also our hope that the Court can work collaboratively with the elected Register to achieve these objectives. It is my hope as well, however the best way to do that is to value Cindy Green’s input and take her advice accordingly. She knows what is needed in her own office. That fact should be respected. So why does this most recent and absurd appointee of this Bouchard character get a housing allowance and over $20K per year more than prior appointees? This is recent news, just happening yesterday as of this writing. 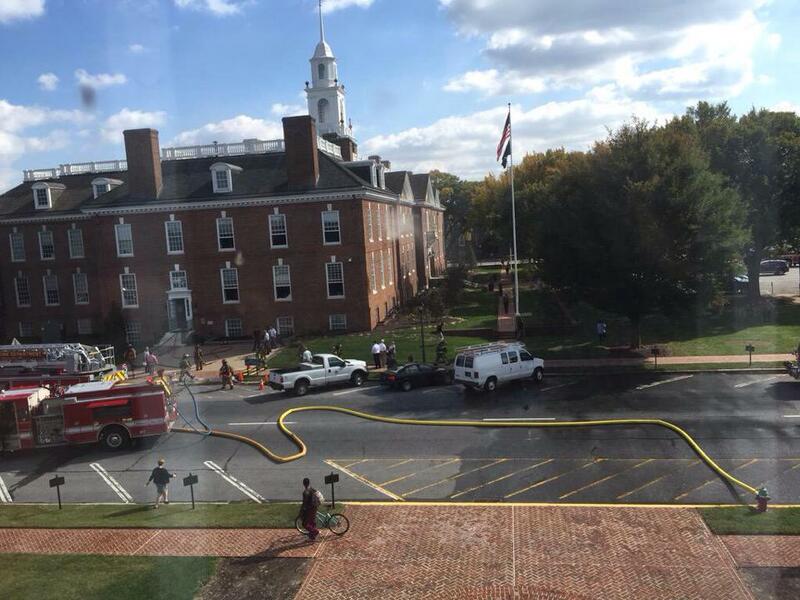 But they have a fire at legislative hall and today the Dover Fire department says the fire started internally and is still under investigation. Aw come on. I got a bridge to sell anybody believes they don’t know what happened with this thing. Somebody dropped a lit cigarette into a trash can, somebody had a candle where it shouldn’t oughta been…..is it possible for these people to ever just tell the truth, real bright and open like, instead of sessions proceeding to determine what version of the truth they should tell? NEXT : Some national scene tidbits and the Sunday political talk show post. 10 Comments on "Political Gossip and Tidbits Wandering About The Small Wonder That is Delaware-The 10/8/15 Edition"
Maybe you can get your priest to perform an official “damn him to Hell” ceremony of some kind. Your capacity for expressing hatred of other people never fails to impress. There won’t be a Chunkin for the same reason that swimming pools no longer have diving boards. The government and lawyers run the country. I suppose football and motorcycles are next; after all, they’re inherently dangerous, too. The United States of Hackey Sack. No wonder the Russians are on the move. What does that mean? You sound like Hillary Clinton. Are you saying that Putin doesn’t recognize weakness and acts accordingly? Are you saying that lawyers and the politicians who protect their interests aren’t the reason pools no longer have diving boards? Or, more likely, did you post what you felt was a clever answer without realizing that it was a frivolous, meaningless response? “The Russians are on the move” because our “swimming pools no longer have diving boards”. Yes, Delacrat. The first thing you do to prepare a society for invasion is to take away their diving boards. Without finely-honed diving skills, our country is defenseless. Yes, but there’s no water in the pools. All the swimming pools are being used to train Syrians to swim to Pea Patch Island after jumping ship, because jumping ship in port is too easy.